As George Lakoff and Mark Johnson pointed out in Metaphors We Live By , we do a lot of our thinking and understanding through metaphors that structure our thoughts and concepts. So pervasive are these metaphors, that in most cases we don’t even realize we are using metaphors at all. 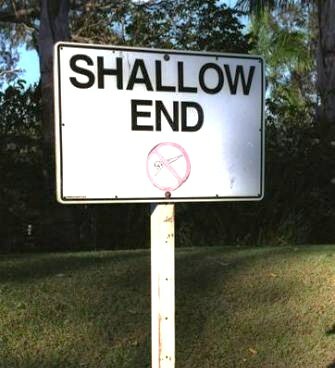 Recently, metaphors related to shallowness and depth have caught my attention. … today, I see within us all (myself included) the replacement of complex inner density with a new kind of self-evolving under the pressure of information overload and the technology of the “instantly available”. A new self that needs to contain less and less of an inner repertory of dense cultural inheritance—as we all become “pancake people”—spread wide and thin as we connect with that vast network of information accessed by the mere touch of a button. The notion of “pancake people” is a variation on the shallow/deep metaphor — a good deal of surface area, not much depth. I first came across Foreman’s analogy in the conclusion of Nicholas Carr’s much discussed piece in The Atlantic, “Is Google Making Us Stupid.” Carr’s piece generated not only a lot of discussion, but also a book published this year exploring the effects of the Internet on the brain. Carr’s book explored a variety of recent studies suggesting that significant Internet use was inhibiting our capacity for sustained attention and our ability to think deeply. The title of Carr’s book? The Shallows . What is interesting about metaphors such as deep/shallow is that we do appear to have a rather intuitive sense of what they are communicating. I suspect we all have some notion of what it means to say that someone or some idea is not very deep, or what is meant when some one says that they are just skimming the surface of a topic. But the nature of metaphors is such that they both hide and reveal. They help us understand a concept by comparing it to some other, perhaps more familiar idea, but the two things are never identical and so while something is illuminated, something may be hidden. Also, the taken for granted status of some metaphors, shallowness/depth for instance, may also lull us into thinking that we understand something when we really don’t, in the same way, for example, that St. Augustine remarked that he knew what “time” was until he was asked to define it. A life spent entirely in public, in the presence of others, becomes, as we would say, shallow. While it retains visibility, it loses the quality of rising into sight from some darker ground which must remain hidden if it is not to lose its depth in a very real, non-subjective sense. Arendt’s comments arise from a technical and complex discussion of what she identifies as the private, public, and social realms of human life. And while she was rather prescient in certain areas, she could not have imagined the rise of the Internet and social media. However, these comments seem to be very much in line with Jaron Lanier’s observation, that “you have to be somebody before you can share yourself.” In our rush to publicize our selves and our thoughts, we are losing the hidden and private space in which we cultivate depth and substance. I come from a tradition of Western culture in which the ideal (my ideal) was the complex, dense and “cathedral-like” structure of the highly educated and articulate personality—a man or woman who carried inside themselves a personally constructed and unique version of the entire heritage of the West. This is not necessarily about the recovery of some Romantic notion of the essential self, but it is about a certain degree of complexity and solidity (metaphor’s again, I know). In any case, it strikes me as an ideal worth preserving. Foreman and Carr (and perhaps Arendt if she were around) seem uncertain that it is an ideal that can survive in the digital age. At the very least, they are pointing to some of the challenges. Given that the digital age is not going away, it is left to us, if we value the ideal, to think of how complexity, depth, and density can be preserved. And the first thing we may have to do is bring some conceptual clarity to our metaphors. I like the description of ‘pancake people’. When faced with a bewildering vista of new opportunities that technology provides then people will tend to spread themselves too thin. It’s inevitable that your public persona is a simplification and shorthand of who you normally are. As we are encouraged to become more public through social media, such as Facebook and Twitter, it is bound to result in less time and energy for concentrated introspection. It is important not to underestimate the power of words. You’re welcome, Jess. Thanks for taking the time to comment.